The Sierra Pelona Mountains, or the Sierra Pelona Ridge, is a mountain range of the Transverse Ranges in Southern California. 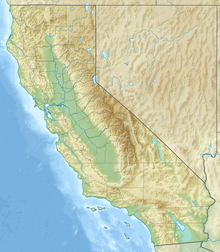 Located in northwest Los Angeles and southern Kern Counties, the range is bordered on the north by the San Andreas fault and lies within and is surrounded by the Angeles National Forest. The Sierra Pelona Mountains lie northwest of the San Gabriel Mountains, which are divided by the wide Soledad Canyon formation. The mountains are flanked to the south by the Santa Clarita Valley and separated from the Antelope Valley to the north by the San Andreas Fault. Toward the southwest lie Vasquez Rocks, thrust up by the fault. The Tejon Pass separates the Sierra Pelonas, the San Emigdios and the Tehachapis near Gorman and Lebec. Within the Sierra Pelonas lie the rural areas of Three Points, Lake Hughes, Elizabeth Lake and Green Valley, as well as Liebre Mountain, Burnt Peak, Sawmill Mountain, Grass Mountain and Mount McDill. The climate of the mountains is a temperate Mediterranean. Summers are mostly dry but for the occasional thunderstorm, and winters comparatively cold and wet. Snowfall is infrequent due to the relatively low elevations of mountains within this range, with only the few tallest peaks regularly receiving snowfall during the winter. Mainly the range falls under the California montane chaparral and woodlands ecoregion, excepting the northeastern flank's gradual slope into the Antelope Valley near Palmdale. The mountains are primarily covered in short grasses, scrub oak trees, yucca, and other chaparral shrubs. The range is prone to wildfires in the summer and fall, especially when the Santa Ana winds blow in from the Antelope Valley. Three major tributaries of the Santa Clara River and numerous minor watercourses and washes drain the range: Castaic Creek, San Francisquito Creek, and Bouquet Creek. Three sag ponds nestle within the narrow valley that divides the mountains from the Antelope Valley: Hughes Lake, Munz Lakes, and Elizabeth Lake. The Native population of California in the Sierra Pelona and Santa Susana Mountains included the Tataviam and Serrano people. They traded with the Tongva and Chumash to the south and west, until the Spanish colonization of the Americas relocated them from their homelands. The San Francisquito Canyon, which runs north-south through the mountains, served as a major wagon route between the Antelope and San Fernando Valleys. This corridor summited at San Francisquito Pass and was part of the El Camino Viejo - an alternate land route to the El Camino Real for reaching northern Spanish and Mexican colonial Alta California - as well as the Butterfield Overland Mail route. The Ridge Route, a landmark two-lane highway that connected Los Angeles to the rest of California, was built along the western flank of the mountain range and was completed in 1915. It was later bypassed by the Ridge Route Alternate (US 99) in 1930, itself superseded by Interstate 5 completed in 1971. The rapid development of Southern California throughout the 20th century saw construction of the Los Angeles Aqueduct and five separate reservoirs to supply water to the region: Castaic Lake, Bouquet Reservoir, Drinkwater Reservoir, and Dry Canyon Reservoir and the St. Francis Reservoir, both now drained and destroyed. Burnt Peak is the tallest mountain in the Sierra Pelona Mountains. Wikimedia Commons has media related to Sierra Pelona Mountains. ^ "Sierra Pelona Mountains". Geographic Names Information System. United States Geological Survey. Retrieved 2015-12-16. ^ , USGS GNIS Detail San Gabriel Mountains.